The Open House event held by V3 Transportation on August 5, 2016 was more than a celebration to mark the move into the company’s new headquarters located in Seville, Ohio. The event, which included elected officials and community leaders from the local area, served as the latest milestone in the rapid growth of an expedited carrier that began its operations in the first quarter of 2013 with two laptops and two cell phones. In a little more than three years, V3 Transportation has developed into an award-winning organization currently employing 48 professionals within operations, customer service and other office positions to support its fleet consisting of 153 trucks featuring 192 top professional expedited drivers. By the end of 2016, V3’s leadership projects that the company’s fleet of sprinter vans, straight trucks and traditional truckload tractor trailers will reach an overall level of 200 trucks. The growth of the V3 fleet and staff has been fueled by an expanding customer base. V3 currently serves seven industry verticals, working with automotive, heavy truck, chemical, consumer products, retail, logistics and entertainment. 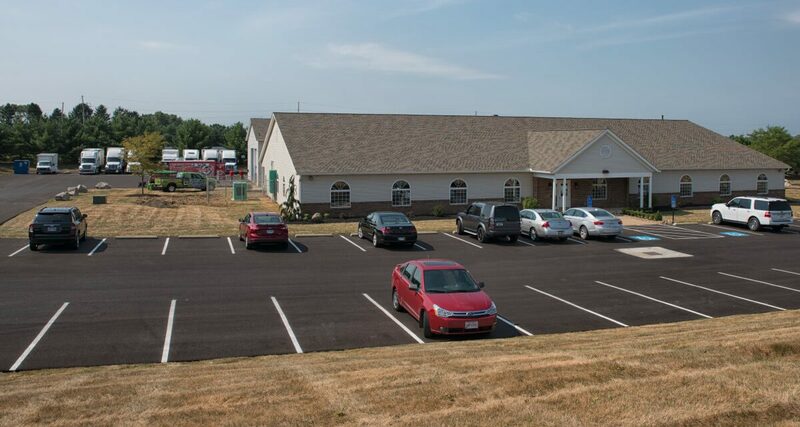 The Ohio headquarters facility has been strategically located as V3 has developed strong customer base within the northeastern part of the state. However, the company is continuing to expand its presence in across the Midwest, Southeast and East Texas markets along with recent growth in the Western 11 states. And this week, company officials disclosed plans during a press call with transportation media outlets that they are looking to develop expedited international through Mexico. V3 has achieved a year-over-year growth rate of at least 100 percent during the company’s three years of operation. “This entire week has been a celebration of the hard work that our entire team has done over the past three years,” said Bob Poulos, CEO of V3. “The dedication of our staff, our fleet owners and our drivers has allowed us to establish a respected reputation as a reliable expedited carrier and it has allowed us to build strong working relationships with great customers. While the Open House celebrated of V3’s move into the new headquarters facility in Seville, the company’s latest milestone moment also displayed V3’s commitment to the Northeast Ohio area and to quality jobs. Along the purchase of the property, V3 commissioned the renovation of the existing facilities with an initial investment of more than $650,000. The building renovations include updates to over 10,000 square feet of office space and changes to more than 6,000 square feet of shop space. By contrast, the company’s previous headquarters’ location in Brunswick, Ohio, was limited to 3,500 square feet. With the additional space secured as well as room to grow through future construction on the acquired property, V3 can move ahead with plans to expand the company’s office staff. Over the next three years, V3 will be looking to add 38 office employees, delivering an even greater economic impact to the area economy well into the future. The headquarters will serve as home to Operations, Customer Service, Driver Recruiting and back office functions as well as the home base for the company’s Executive Team. V3’s drivers will have a driver’s lounge with big-screen television, a kitchen area and wireless Internet access. The drivers’ area also features laundry facilities. In addition, V3 has built a large orientation area that can accommodate up to 20 new drivers in a single class. In January, Sliter was named as an Innovator of the Year by Heavy Duty Trucking Magazine for the support structure he and the V3 team have put into place for recruiting and retaining drivers. Meanwhile, in June, V3 was honored by Omnitracs as the Alliance Pro Company of the Year. Along with transitioning into a new headquarters, one of the bigger moves by V3 occurred in January with the addition of Craig Amato as a Partner and Senior Advisor with the company. Amato is the founder Panther II Transportation, Inc. and he led Panther as its CEO for 16 years. PreviousCargo Van, Straight Truck, Tractor: Which is Best for Your Expedited Trucking Business? NextThe Insurance Zone: Why do under 10K GVW units carry $1 Million Liability?